Would you please let me know the most suitable price of following models of Panasonic Cordless Phone? Note: We tend delivery address be our Dubai office. EDITOR: I do not sell phones. EDITOR: Cordless phones are quite tricky, because they’re a combination of a telephone and a radio transmitter/receiver, you have the issues of range, sound quality and security that you do not have on a standard corded phone. Also different cordless phones of various frequencies may work/may not work in your house as each house has different appliances/structural issues which can interfere with it. 2. Digital cordless phones will be more secure and have a better signal than analog phones. Why is it seemingly impossible to buy a corded phone with built-in answering machine in Australia? All the models for sale are cordless. I don’t want cordless. I want a corded phone! I see they are available overseas but not here. What is the matter? Is it possible to buy a corded phone overseas (say in the US) and use it in Australia? Do we have compatible phone lines? EDITOR: I’m not sure whether a corded phone bought in the US would work in Australia, anyway why would you bother since most people use a cordless phone on their landline and keep a cheap corded phone as a backup to use during power failures? I am about to buy my fourth cordless phone and I prefer the base to act as another handset. Would 5.8 GH cordless phone be better than 2.4 GH cordless phone within a wirless internet environment? If it is better, at what distance from the base you can still have a clear conversation. I am saying this because I just bought a 5.8 GH of another brand and we can not use the phone at all upstairs (no reciption at all in the seconed floor within the house). Please advise. Many thanks. 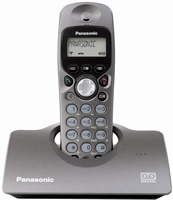 We have noticed that the receive listening level on our Panasonic digital cordless phone is sometimes very low. This started after we set up a WiFi system in the house. Is the WiFi possibly interfering with the phone? The phone frequency band is 5.8 GHz. I’m not sure what the WiFi is operating on, but it does seem odd that the effect of interference would be to have low volume. I would expect it to create distortion in the speech like a poor cellphone connection. Can you offer any insight? I’m also considering purchasing a 2.4/5.8 cordless phone. BUT as a telephone tech friend has advised – stick with 1.8 or 2.4. these produces less harmful radiation than the 5.8ghz units. As he has said, the jury IS still out, but why risk frying your brain, when lower frequency units are available. As he also ventured, it’s a bit like the smoking debate, they will hide the truth over profits. I was given the cordless phone Panasonic kx-tcd445alt by a friend with no manual book. Can anyone help me how to turn the answer machine off because every time it rings 2 times I would have to run for the phone or else it will go straight to the answer machine. Please help me how to turn this answer machine off and how to make it ring more then 2 times before it goes to the answer machine. Having been through this exercise of purchasing a cordless phone I can honestly state that the lower the frequency the greater the range. Every sales person I spoke to told me the exact opposite and recommended the 5.8 Ghz which we initially purchased and were so disappointed we returned it as we could not get 50 metres and still had the base station in line of sight through a glass door. Our original phone was a Uniden 800Mhz and we had no trouble going 500 metres or more. We live on 80 acres hence we need this range so we can take the phone with us. Unfortunately the 800 Mhz cordless phone keypad packed up and no spare parts are available and the phone is no longer available otherwise I would buy one. We replaced the 5.8 Ghz phone with a 1.8 Ghz and while the range was not as good as the 800 Mhz phone it was a definite improvement over the 5.8 Ghz model. I just wish someone would test this out comparing the different frequency phones under the same conditions and publish their results so more people are not misled. I need a corded phone with answering system. i bought a uniden wdect but it is the wrong shape for the handset lifter. are there any others or does someone out there have a panasonic corded with answering system which might work for me which they don’t need? They compared cordless phones with answering machines & the best one was Panasonic KX-TG1840 which is a 1.8GHz phone. I have also read only praise for this phone on other forums. Choice has also done tests & comparisons on cordless phones without answering machines but you’d have to look that up for yourself. I’m in South Africa and have a Panasonic KX-TC2000SAB cordless phone. We are going to Australia and want to know if we can use this phone over there. could you please advise on how to stop my cordless model no KX-TCD445AL from beeping all the time, making phone calls impossible to make. Hi I have a Panasonic KX-TG4392ALT. I wanted to disable the answering machine but in vain. There is an option available in the manual but it temporarily disables for 15 rings and then it goes back to the answering machine mode. And every call after that 15 rings it goes back to only 5 rings. I am really fedup with that. Can you please advise me if I can disable this completely no matter for how many rings a caller makes. I have KX-TG2635JX and i have your problem too , after 15 ring the answering goes on and i couldn’t find any solotion for it. please notify me here if you find any. Hmm, I would always intend to go for the 2.4Ghz, in my house it seems to work the best, a 21st Century manor built not so long ago and was designed with the network in ming, even the lights etc all work of it, I have a neat little app on my iPhone that controls it all aswell. The only problem is though, is that my cellular signal is very poor … could this be the issue?